SR1 Dual-Domain Audio Analyzer is a stand-alone instrument that delivers cutting edge performance in a wide variety of audio measurements. 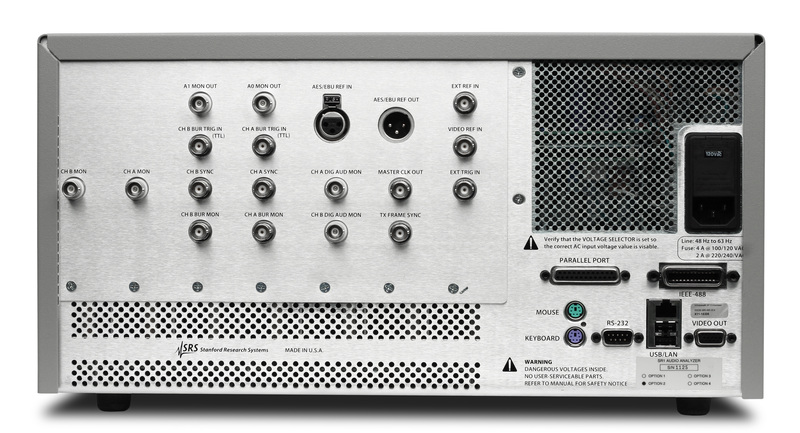 With a versatile high-performance generator, an array of analyzers that operate symmetrically in both the analog and digital domains, and digital audio carrier measurements at sampling rates up to 192 kHz, SR1 is the right choice for the most demanding analog and digital audio applications. 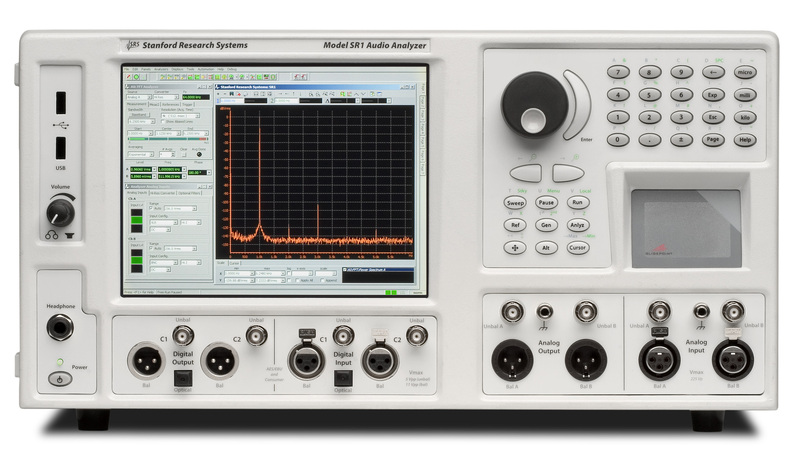 Introducing SR1 Dual-Domain Audio Analyzer - high performance audio analysis at a very affordable price. SR1 uses an integrated computer running the Windows XP embedded operating system, so operation will be immediately familiar and intuitive. Depending on the application, SR1 can be operated with an external mouse and keyboard, or by using the front-panel knob, keypad and touchpad. Seven on-screen tabbed pages are available for arranging panels, graphs, and displays. Screen setups, data, and instrument configurations can be quickly saved and recalled to either the internal hard disk or to a flash drive connected to one of the two front-panel USB connectors. An optional 1024 x 768 XVGA monitor (opt. 02) provides better resolution and allows more information to be displayed. While SR1’s configuration panels offer total flexibility in setting up every detail of the analyzer, at times it is useful to get a measurement going quickly, without worrying about infrequently used parameters. That’s where QuickMeas comes in. QuickMeas gives SR1 users the ability to get up and running on many common audio measurements such as Level, SNR, Frequency Response, and Crosstalk after answering just a few simple questions about the inputs and outputs of the DUT. When the measurements are finished, the results are available in a clear, easy-to-understand report. At the heart of SR1 is a uniquely flexible analog signal generator. All of the standard audio waveforms are available including sine, log-swept sine chirp, synchronous burst sine, noise (white, pink, and filtered), standard intermodulation test signals (SMPTE, CCIF, DIM), square waves, arbitrary waveforms (ASCII and .WAV), ramps and multitone waveforms. 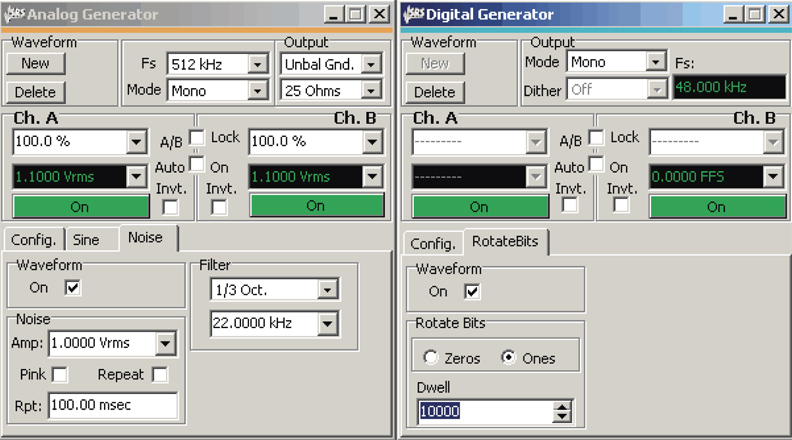 Many of these signals can be combined in the generator allowing you to create an unlimited number of test waveforms. But the analog signal generator doesn’t sacrifice performance for flexibility. With a flatness of ±0.008 dB (20 Hz to 20 kHz) and a residual THD+N of -106 dB (20 Hz to 20 kHz), SR1’s Low Distortion Sine rivals the performance of any analyzer. Multitone waveforms with up to 50 tones, each adjustable in frequency, amplitude, and phase are calculated and loaded in real-time, without having to run a cumbersome off-line program to generate arbitrary waveform tables. A convenient FFT Chirp waveform is automatically synchronized to the FFT analyzer allowing instant FFT measurements of frequency response (magnitude and phase). 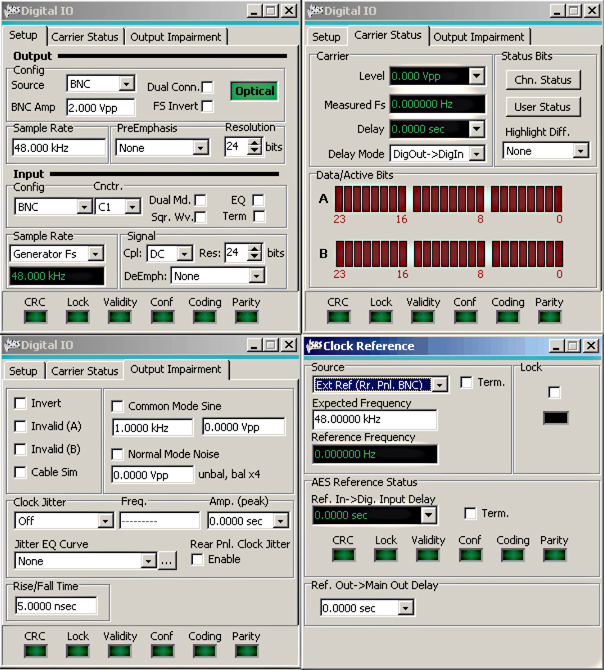 The digital audio output sampling rate is continuously adjustable from 24 kHz to 216 kHz (single and dual connector). Full control over transmitted status bits (in both professional and consumer formats), user bits, and validity bits is provided. For digital interface testing, a variety of impairment signals can be imposed on the digital audio carrier. Carrier impairments include variable rise time (5 ns to 400 ns), common mode sine waves, normal mode noise, and several jitter waveforms (sine, square, and noise). All of SR1’s sampling clocks are derived from an internal timebase with 5 ppm accuracy. For the most demanding applications, an optional atomic rubidium (PERF) timebase is available with an accuracy at shipment of ±5 x 10-11, and a 20-year aging specification of )less than 5 ppb. Additionally, the timebase may be synchronized to an external clock, an AES11 reference signal, or any standard video signal. The heart of SR1’s measurement abilities is its versatile set of analyzers which operate symmetrically on both analog and digital audio signals with no need to purchase additional options. Up to two analyzers can be run simultaneously on either the analog or digital inputs. The Time Domain Detector makes all of the standard audio measurements including Amplitude, Crosstalk, and THD+N. Continuously variable bandwidth limiting and standard weighting filters are included. The post notch-filter distortion signal can be fed to an FFT analyzer for a live spectral display of distortion, or to the rear-panel monitor output or speaker. The Single-Channel FFT and Dual-Channel FFT Analyzers offer live spectral displays with full zoom and heterodyne capability. The full resolution of the analyzer can be applied to any frequency range down to 1/512th of the full measurement bandwidth, leading to an effective resolution of 16M FFT lines. Several averaging algorithms can be applied to bring out low level signals. The two-channel FFT analyzer offers true single-shot frequency response measurements for the ultimate in accuracy. SR1 also has a complete set of impulse response measurements including impulse response, quasi-anechoic frequency response, and energy time-. curve. Since SR1 is a true two-channel FFT, it isn't limited to MLS waveforms, but can use virtually any waveform. The THD Analyzer makes frequency selective THD measurements on two user-selectable sets of up to thirteen harmonics of the input signal. The IMD Analyzer makes standard audio distortion measurements including SMPTE, CCIF, and DIM. Frequency selective analysis ensures high measurement accuracy. The Histogram Analyzer displays live histograms of input signal amplitudes and probability distributions. Realtime fits to Gaussian distributions can be generated. The Multitone Analyzer, in combination with the Multitone Generator, can be configured to make fast single-shot measurements of a variety of audio parameters including Level, Frequency Response, THD+N, THD Total Distortion, Noise, Crosstalk, and IMD. SR1 provides a complete set of measurements for digital interface testing. Carrier level and sampling frequency are measured directly. Status bits are fully decoded in both professional and consumer formats, and user bits are displayed as well. SR1’s Jitter Analyzer measures jitter in both the time and frequency domain, including continuously variable bandwidth limiting and weighting in both domains. For frequency domain measurements, live zoomable and heterodyned spectral displays of jitter are available. Using the jitter chirp waveform, you can characterize jitter transfer functions in under a second. With a residual jitter of only 600 ps, the performance of SR1’s jitter analyzer is unbeatable. An optional 80 MHz transient digitizer (opt. 01) provides additional digital audio carrier analysis. Operating on a record of up to 2M samples, the digitizer computes and displays the time record of the input signal and its jitter, input spectrum, jitter spectrum, and the probability distributions of the input and jitter amplitudes as well as the pulse width and pulse rate. Full color eye-diagrams can be generated allowing easy testing against user-configurable eye limits. SR1 offers unprecedented flexibility for user scripting and remote programming. On-board scripts can be written in VBScript, Jscript, or Python with full access to all of the instrument’s capabilities as well as the ability to create simple user-interfaces for running tests. SR1 has a complete hierarchical GPIB command set, and GPIB commands can be sent over the standard IEE-488 interface, RS-232 port, or over the Ethernet on a TCP/IP network (VXI-11). Finally, SR1 has a complete COM interface allowing instrument operation to be automated from any COM capable application such as Visual Basic, LabView, or Microsoft Office. Learning mode is a powerful tool for quickly creating scripts without detailed knowledge of the programming environment. SR1 creates a script by recording each keystroke or user operation, and then converts the script to a VB script of Jscript program. These programs can be saved and edited like any other script, then run in the future. FFT Chirp Equal power in each FFT bin. Low Pass Filter 4th order Butterworth, adj. from Fs/40 to 0.45Fs, 20 kHz, 40 kHz and 80 kHz fixed elliptical filters per AES17. High Pass Filter 4th order Butterworth, @22 Hz, 100 Hz, and 400 Hz. 20 kHz, 40 kHz and 80 kHz fixed elliptical filters per AES17.